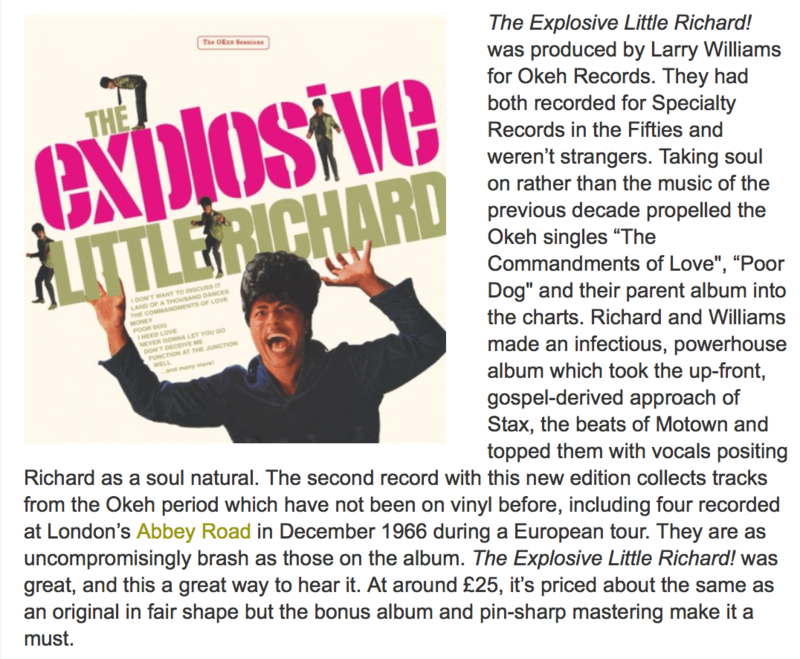 The Explosive Little Richard!was produced by Larry Williams for Okeh Records. They had both recorded for Specialty Records in the Fifties and weren’t strangers. Taking soul on rather than the music of the previous decade propelled the Okeh singles “The Commandments of Love", “Poor Dog" and their parent album into the charts. Richard and Williams made an infectious, powerhouse album which took the up-front, gospel-derived approach of Stax, the beats of Motown and topped them with vocals positing Richard as a soul natural. The second record with this new edition collects tracks from the Okeh period which have not been on vinyl before, including four recorded at London’s Abbey Road in December 1966 during a European tour. They are as uncompromisingly brash as those on the album. The Explosive Little Richard! was great, and this a great way to hear it. At around £25, it’s priced about the same as an original in fair shape but the bonus album and pin-sharp mastering make it a must.